Anyone who reads Georgette Heyer or other Regency-era historical fiction is surely familiar with the phrase “outside of enough” – one of those “cant” phrases that is self-explanatory, doesn’t need a lexicon or such to figure out its meaning. It is a great turn of words, isn’t it? and so much more effective that “that’s enough” or “enough is enough” or “I’ve had enough” or “more than enough”, or “this is too much” or “enough already”! But where did it come from? When was it first used? I don’t currently have access to the OED and it does not show up in the phrase reference sources I have or in online sources. Joanna Waugh on her website says it came into use around 1887. It now seems overly used – certainly in every historical romance novel, but also in political writings, general conversation [just ‘google’ it!]. I am reminded of the phrase “gone missing”- a term I first heard in England years ago and needed to have it explained to me! – I later heard it on Canadian news programs, but now I hear it everywhere, read it in the newspapers, definitely a British turn of phrase adopted here in the US. Fig. 1 "We have been engaged these four years"
Fig. 2 "She could have no doubt of its being Edward's face"
So, I must carry on and dig deeper and find a better reference – if anyone has any thoughts, please comment – but shan’t we at least credit Austen (via Heyer I would think) with what appears to be the source for the excessive use of the term today? – I do feel the need to nearly scream, “all right, all right, the constant use of this phrase is really the outside of enough”! Copyright @Deb Barnum, Jane Austen in Vermont, 2011. 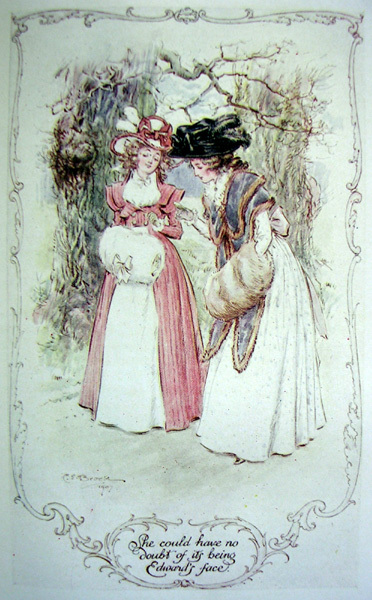 This entry was posted in Austen Literary History & Criticism, Jane Austen, Literature, Social Life & Customs and tagged C.E. Brock, Jane Austen, Jane Austen and Language, Lucy Steele, Outside of enough, Sense and Sensibility. Bookmark the permalink. Charming, Deb! It reminds me of “St. Sepulchre-without-Newgate” and “St. Giles-without-Cripplegate”!! meaning just outside those two gates of the city wall by the same names – prepositional phrase preceding an adjective (in JA’s case) and preceding a noun (in the case of church names), but both adding to our understanding. I wonder if JA’s father had something in his library that was her source or if it was simply something her mother (with her Leigh “better society” background) said. Wherever it comes from, it’s lovely! I agree Marianne – it is a great phrase! – Thank you for visiting and the streets “without” gates references – not always easy to figure out these English concoctions! Wonderful stuff, Vic! I love the phrase as well. Needless to say, I’m delighted my Dictionary of Slang and Unconventional English was wrong about its etymology. Thanks to your research, I now can use it in my writing. Kudos! Hi Joanna – Deb here, not Vic [who is at Jane Austen’s World, and lucky for her, not in Vermont at this time of year!] – but thanks for the compliment! I find your dictionary very useful, so sorry to find that this was off – in searching the term, your dictionary is the only link that comes up! – do you know where you found your reference in the first place? Stay tuned! – and thanks for visiting Joanna! Forgive me for calling you Vic, Deb. My only excuse is that haven’t had my second cup of morning coffee yet! Our messages crossed paths! – as I am only on my first cup of tea, I completely understand! 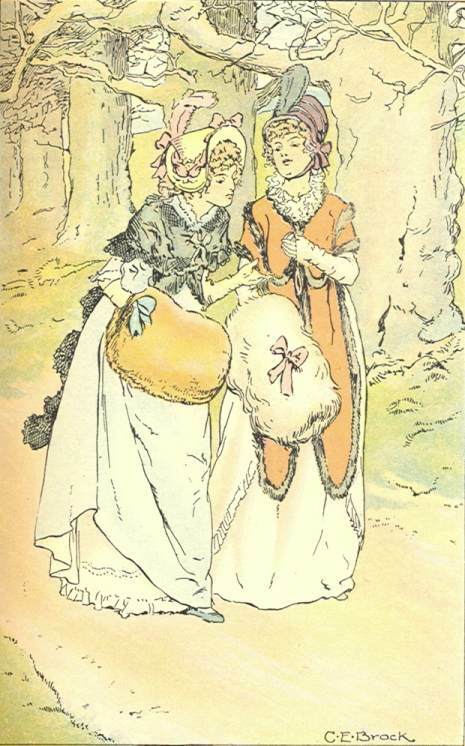 The phrase ‘outside of enough’ is frequently used by Elinor brent- Dyer in her ‘Chalet School’ series of girls’ stories, published between the 1930s and 1960s. But I’ve never known anyone who used it in real life. It is a wonderful term isn’t it! – I know it from Heyer of course, but was surprised to find it in Austen – thank you for bringing this series to my attention! I am currently reading Sense and sensibility, (pardon my English for my mother tongue is French) and i have come across your website because i couldn’t really understand the phrase “outside of enough” and was looking for its meaning. Thanks to you Deb i understood it better and got a general idea of its sense, but still i am a bit “lost in translation” ;-). Indeed in this particular extract of Jane Austen i don’t quite understand it. Could you try to explain it to me with maybe a little more details?